Prescription drug coverage for PPO Plans A & B are administered through Envision Rx for employees, non-Medicare retirees, and their dependents. For Medicare-eligible retirees and/or dependents, prescription drug coverage is administered through EnvisionRx Plus. For more details on these plans (including tiers, copays, and contact information), please review the “Overview” section below. For details regarding the JHMB’s special program for maintenance medications, please select the “Rx90 Program” tab below. For details regarding the JHMB’s Select Formulary for 2018, please select the “Select Formulary ” tab below. NOTE: The prescription drug coverage information provided in this section does not apply Plan C Kaiser participants. For information specific to Plan C participants, please visit the “Your Benefits” page. EnvisionRx plan has 4 tiers based on its current drug formulary (a list of prescriptions drugs covered by the plan). EnvisionRx determines which drugs are placed on the formulary via its Pharmacy and Therapeutics Committee, which selects drugs from virtually all therapeutic types and bases its decisions upon factors such as – drug effectiveness, cost, quality, safety and potential side effects. The formulary is updated periodically as new drugs or new prescribing information becomes available. – Tier 1 – Generic Drugs ($0/$0): Medications that are used for treating hyperlipidemia, hypertension, diabetes, and depression. – Tier 2 – Generic Drugs ($10/$20): All other categories of covered, generic medications. – Tier 3 – Preferred Brand-name Drugs ($35/$70): Covered drugs included on the formulary. – Tier 4 – Non-preferred Brand-name Drugs ($50/$100): Covered drugs not included on the formulary. It is important to note that if you purchase a brand name prescription when there is a generic equivalent available, you will pay the brand copay plus the difference in cost between the brand name and the generic. However, should your physician indicate “Dispense as Written” on the brand name prescription, the cost difference penalty will be waived if authorized by EnvisionRx. 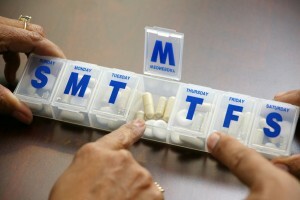 NOTE REGARDING MAINTENANCE MEDICATIONS: For members taking maintenance prescriptions (such as a drug that is required to treat a chronic condition such as diabetes, high blood pressure, or high cholesterol) this program requires that you adhere to the Rx90 maintenance medication program. Please select the “Rx90 Program” tab above for more details. For assistance with your prescription drug benefit, please first contact the appropriate EnvisionRx Customer Service phone number shown below based on your plan participation. If you feel that your issue is not being addressed appropriately, you may ask to speak with an EnvisionRx Customer Service Supervisor. Should you feel that you require additional support beyond the EnvisionRx supervisor, you may ask the supervisor to send an email to “FUSD Member Issues.” This process has been established to more effectively handle JHMB plan participant issues and concerns. EnvisionRx Participants: For assistance with your EnvisionRx prescription drug benefit, please contact the EnvisionRx Customer Service Help Desk at (800) 361-4542. The Help Desk is available to assist you with prescription questions 24 hours a day, 7 days a week. EnvisionRx Plus Participants: The EnvisionRx Plus plan has a different customer service phone number than the EnvisionRx plan. 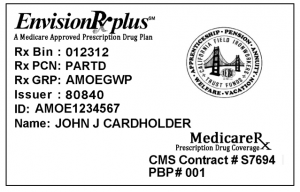 If you have been issued an EnvisionRx Plus Medicare Prescription ID card similar to the one shown on the right, then you are a participant in the EnvisionRx Plus plan. For questions specific to the EnvisionRx Plus plan, please call (844) 293-4760. 2. You MUST use a pharmacy in the Rx90 Network for maintenance medications (EnvisionMail, Rite Aid, Walgreens or Costco retail pharmacy). The plan does allow two (2) courtesy fills after July 1, 2017. Thereafter, all maintenance medication refills must be filled for a 90-day supply and at an Rx90 network pharmacy. NOTE: Envision Rx Prescription Drug Plan members do not need to have non-maintenance prescriptions filled within the Rx90 network; members can continue to fill non-maintenance prescriptions at any network pharmacy. For more information about the Rx90 Program, please review the FAQ available by download below. The Joint Health Management Board (JHMB) of the Fresno Unified School District continually looks for solutions to manage the rising cost of prescription medications. It is our goal to keep quality coverage affordable for members. After careful consideration, the JHMB will be integrating the following change to the pharmacy benefit plan effective January 1, 2018. Though this change will not occur until January 1, 2018, we feel it’s important to provide you with enough notice to discuss any potential impacts with your healthcare provider before this change occurs. In 2016, the JHMB introduced 3 copay tiers for Generic Drugs ($10), Preferred Brand-name Drugs ($35), and Non-preferred Brand-name Drugs ($50). This original change was made in the interest of ensuring that our members have access to generic drugs and preferred brand-name drugs at affordable rates. Earlier this year, the JHMB added a fourth tier to provide members with access to generic drugs treating targeted health conditions (high cholesterol, high blood pressure, diabetes, and depression) at $0 copay. Each of these changes were made after careful consideration by the JHMB and its partners to manage the rising costs of prescription drugs while ensuring that our members have access to quality medications at affordable rates. In these continuing efforts, the JHMB has approved the implementation of Envision Rx’s Select Formulary for Plan Options A and B effective January 1, 2018. Under the Select Formulary program, the JHMB’s existing 4 copay tiers remain, however the drugs available within those tiers may change based on the latest Envision Rx standards. Currently, Envision’s research indicates that as many as up to 1100 members in Plan Options A and B may be impacted by the implementation of the Select Formulary drug list. A formulary is a list of prescriptions drugs covered by the plan. EnvisionRx determines which drugs are placed on the formulary via its Pharmacy and Therapeutics Committee, which selects drugs from virtually all therapeutic types and bases its decisions upon factors such as – drug effectiveness, cost, quality, safety and potential side effects. The committee is composed of practicing physicians and pharmacists from a wide variety of medical specialties. The list is updated periodically as new drugs or new prescribing information becomes available. In early November, Envision Rx will send more detailed communications regarding which drugs are impacted by the Select Formulary drug list. At that time, we recommend that you review the drug list and identify if any of your current prescription drugs will be excluded. If so, we recommend that you discuss the potential switch from a prescription on the exclusions list to a prescription on the approved list of alternatives with your healthcare provider. If your provider affirms that your use of the current prescription is medically necessary, then you or your provider may complete a request for prior authorization to continue receiving the medication after January 1, 2018. Please be sure to look out for more information in the mail coming soon from Envision Rx. Until then, should you have additional questions regarding this upcoming change to your prescription drug benefit, please contact the EnvisionRxOptions Customer Service Help Desk at (800) 361-4542. The Help Desk is here to assist you with prescription questions 24 hours a day/7 days a week. For more information about the Select Formulary, please review the FAQ available by download below.